I’ve just been working on a new commission for one of my copper lamps. It’s going really well, but the structure of it is pretty complex and I’m finding the process of wiring it up particularly troublesome. I’ve made life even more difficult for myself (mainly because I want the piece to have real impact) by including a few ‘hidden extras’ within the piece (all of which will be revealed in the final photos! ), each of which require an additional strand of wiring. This means that the total piece requires three strands of dual core, low voltage wiring to be run through the entire length of the piece. The photo below (sorry it’s a bit fuzzy!) shows some of the intricate features and tight bends that the cables have to be fed both through and around. 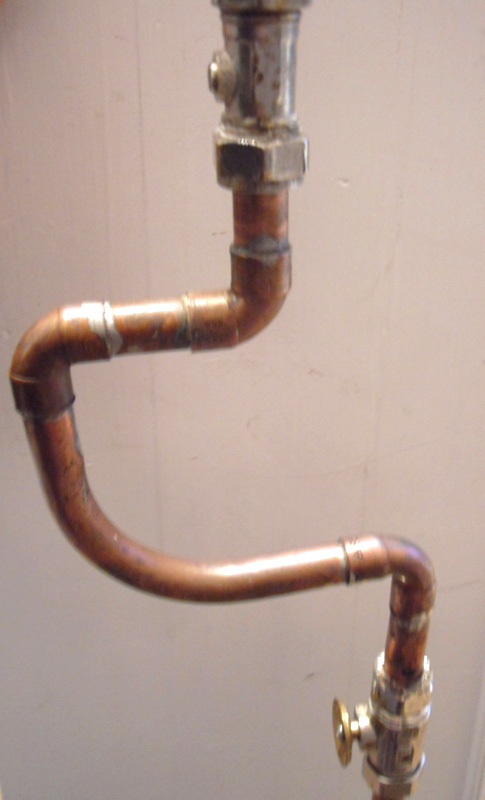 To make this process even more difficult, the lamp is made entirely of 16mm copper pipe and associated fittings, so is pretty narrow at the best of times. Factor-in the internal ridges of the various soldered couplings, and the fact that the tubing is recycled so has a dirty, corroded and lime-scaled inner surface, and the whole job seems pretty-near impossible at times. My normal process is to feed a piece of very strong, yet very thin, nylon string through the pre-soldered lamp, tie this string firmly to the cable (or in this case three sep cables tied together) and feed this through the tubing by a combination of pulling on the string whilst simultaneously pushing the cable from the other end. With the current piece, even just getting the string fed down the entire length of the piece proved tricky! I realised that what I needed was a small yet heavy weight, neither too long or too wide so that it wouldn’t feed itself round the hard turns of the various joints (I normally tie a small nut to the end of the string to act as this weight, but this simply wasn’t up to the job in this instance). I thought of going to a fishing tackle shop to see if they sold small lead weights but, as always, preferred the idea of trying to make my own. Hence, I came up with the following simple, yet surprisingly effective process. Firstly I took a block of plaster (cast from hard setting moulding plaster poured into the bottom of an old plastic bottle) and drilled some deep holes, of varying diameters (to give me options of size and weight) in to this. 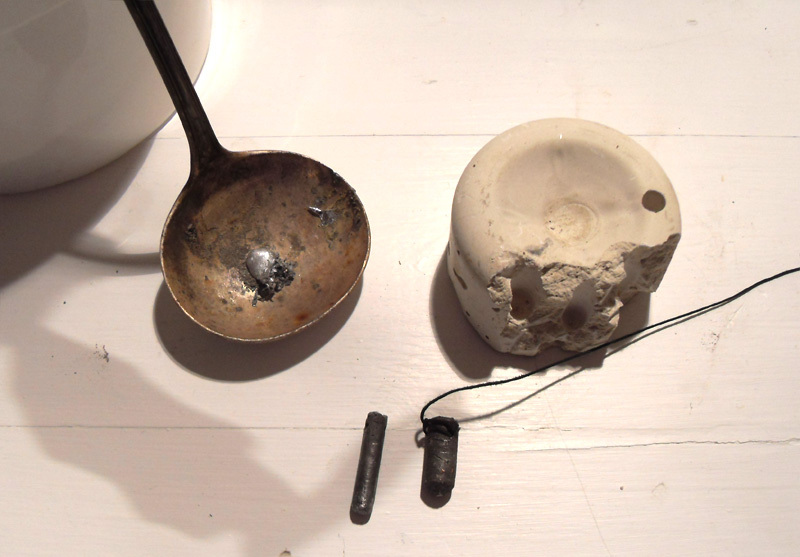 I then melted a small amount of lead in an old ladle, and poured this into the holes in the plaster. When cooled, I simply broke the plaster away, leaving the smooth rods of lead exposed. They required very little cleaning up – all I did was drill a very small hole directly though the end of each of them to allow a string to be tied onto the weight. They worked really well in practice. The lead is heavy enough to drag the string down the tubing, and I found I could easily cut the weights with just a pair of pliers to make them shorter if need be to help negotiate the really tight curves. 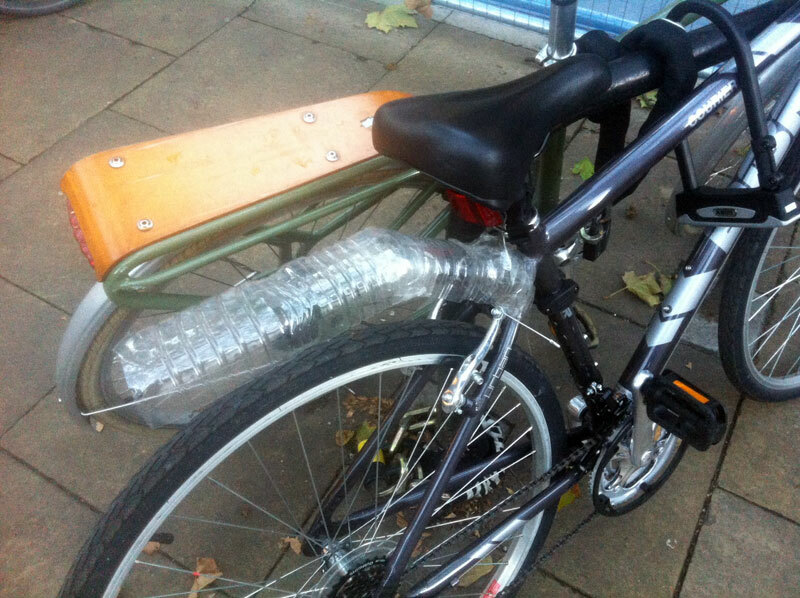 Walking through London last week I saw the following bike ‘kludge’ – a fantastic temporary mud flap made out of a couple of old water bottles and lots of sticky tape! I’m not sure how long the thing would hold up under heavy weather conditions, but I am guessing it was serving someone well for the moment!